Origin and Habitat: USA - Arizona (Santa Cruz and Cochise County) New Mexico (Hildago and Sandoval Co, From Sierra and Chaves to Eddy Co), western Texas. Mexico (northern Chihuahua). The endemic Mexican taxa have relatively large flowers like those of Epithelantha bokei. Altitude: It grows from 500 to 1800 metres in elevation. Habitat and Ecology: Widespread in desert grasslands and woodlands It grows on crevices, coarse gravel, cliffs, sedimentary calcareous rock (rarely igneous) substrates on hills and ridges in the Chihuahuan Desert. 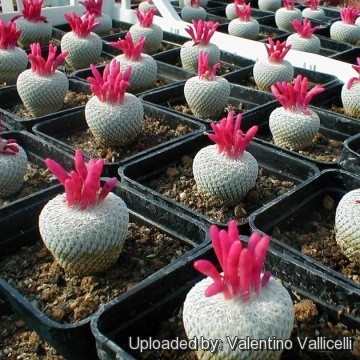 These cacti are normally found in small clusters because the seeds fall nearby. Also wind, rain, and wildlife help with the dispersal of seeds. The species has an exceptionally large range, high number of individuals and low threat, therefore it is listed as Least Concern. Epithelantha micromeris f. cristata hort. Epithelantha micromeris var. neomexicana n.n. Epithelantha micromeris var. rufispina (Bravo) Backeb. Epithelantha greggii var. rufispina (Bravo) Backeb. Epithelantha micromeris var. texensis n.n. Epithelantha micromeris var. texensis f. cristata hort. Epithelantha micromeris var. dickisoniae hort. 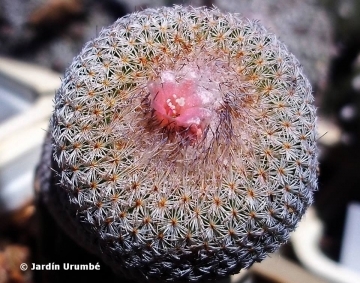 Mammillaria micromeris var. greggii Engelm. Epithelantha greggii subs. potosina D.Donati & Zanov. Epithelantha micromeris var. densispina (Bravo) Backeb. Epithelantha greggii var. densispina (Bravo) Backeb. Epithelantha pachyrhiza subs. elongata (Backeb.) D.Donati & Zanov. Epithelantha pachyrhiza var. elongata Backeb. Epithelantha greggii subs. polycephala (Backeb.) D.Donati & Zanov. Epithelantha micromeris var. unguispina (Boed.) Backeb. Epithelantha unguispina (Boed.) D.Donati & Zanov. 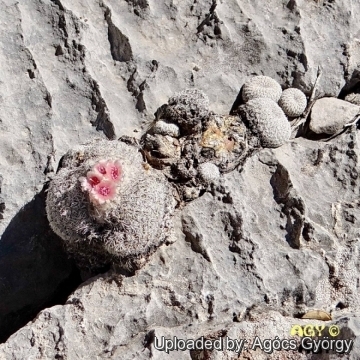 Mammillaria micromeris var. unguispina Boed. Epithelantha unguispina subs. huastecana D.Donati & Zanov. 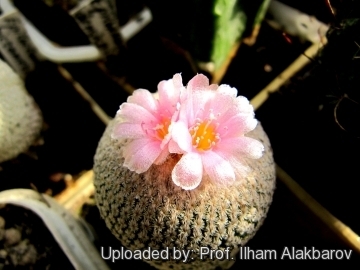 Description: Epithelantha micromeris is a miniature globose cactus, erect, unbranched or in small clumps, not deep-seated in substrate, appearing ashy grey and relatively rough in general aspect. Stem: Unsegmented, mostly spheric or obovoidal, rarely cylindric, often flat-topped with a depressed centre, 1-5(-9)cm tall and up to 2-4 (-7,5) cm in diameter, occasionally more; surface completely obscured by spines; cortex and pith are not mucilaginous. Tubercles: Numerous, not confluent into ribs, hemispheric or short cylindric, very low, ca. 1(-3) mm long arranged in tight spirals around the plant. Spines: 20-35(-40) white to ashy grey 2-5 mm long, appressed on sides of stems, straight, terete, slender, innocuous, in 1-3 superimposed series except for a longer (4-12 mm) and erect adaxial tuft on the top, on sexually mature stem apex often greyish or purplish white, frequently with brown bases, collectively forming brown spots at the centre of each spine cluster. The upper radials on the young tubercles longer and connivent over the apex, narrowly clavate, the upper half finally falling off. Spine clusters at the sides of stem 4-5(-7) mm in diameter. Smooth or microscopically roughened by break-up of epidermis, not distinguishable as radial and central spines. In fully adult plants, the distal portions of the longest spines are worn, leaving the apex of the plant covered with short, innocuous spines. Flower: Inconspicuous, funnelform diurnal, borne at adaxial margins of spine clusters in the plant top. Only partly opened just distal portion visible, as they barely stick out above the wool obscured by longer spines at stem apex. Outer tepals entire or sparsely erose-fimbriate; Inner tepals 5-8 per flower, pink to white (rarely yellow), (1-)2-6(-9) × 3(-5) mm; stamens 15-16; ovary smooth, scales, hairs, and spines absent; stigma lobes (2-)3-4(-6), white, to 1 mm. Blooming season:: Flowers late winter-early spring (Feb-Apr). Fruits: Indehiscent, bright red, thin narrowly cylindric, 3-20 × 2-3(-5) mm, weakly succulent, soon drying and papery, smooth, spineless; pulp absent; floral remnant deciduous. Fruiting late spring-early summer (Apr-Jun). Seeds: Blackish, obliquely hemispheric reticulated in 0,5-1,5 mm diameter. Remarks: Epithelantha micromeris var. micromeris has some of the smallest flowers among cactus species. Unlike other taxa in this genus, it is Autogamous. Its fruit are known in mexico as "chilitos." Epithelantha micromeris (Engelm.) F.A.C.Weber in Bois: Miniature globose cactus, unbranched or in small clumps. Produces small pink flowers followed by attractive red fruits . Spines are white or greysh, innocuous and appressed on sides of stems. Epithelantha micromeris f. cristata hort. 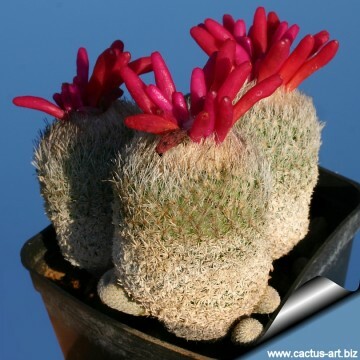 : This is a miniature cactus that makes a nice and tangled cluster of fine crests. The stem surface is completely obscured by small pectinated ashy-grey to white spines. Epithelantha micromeris var. dickisoniae hort. 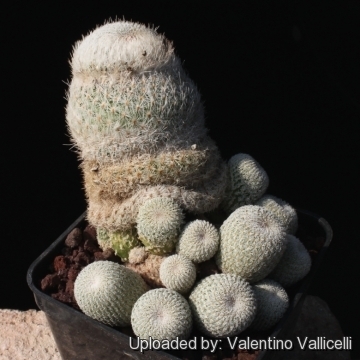 : Minute clustering cactus of doubtful status (but common in cultivation), it shows similarities with Epithelantha micromeris subsp. polycephala and Epithelantha pachyrhiza. Spines are whitish turning to a brownish tinge in adult plant's crown. Roots: Tuberose. Epithelantha micromeris f. elongata (Backeb.) Bravo: It has elongated stems and a thick tap-root. It is intermediate between E. micromeris and E. pachyrhiza. Distribution: Ramos Arispe, Coahuila, Mexico. Epithelantha micromeris subs. greggii (Engelm.) N.P.Taylor: This subspecies has a rough, somewhat bristly appearance with iIndividual stems up to 5 cm or more in diameter,. Spines are chalky white to reddish brown. Distribution: Northern Mexico, especially Saltillo, Coahuila. Epithelantha micromeris subs. 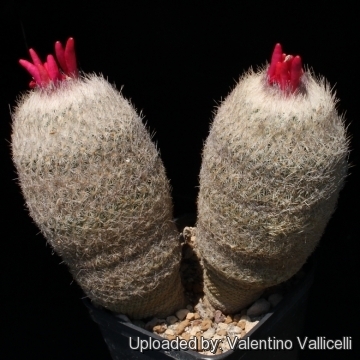 greggii f. cristata: crested form. Epithelantha micromeris subs. pachyrhiza (W.T.Marshall) N.P.Taylor: It has tuberousroots and a stem only partly obscured by the white to orange-tan spines; Distribution: Strictly endemic of southeast and northeast of Saltillo. Epithelantha micromeris subs. polycephala (Backeb.) 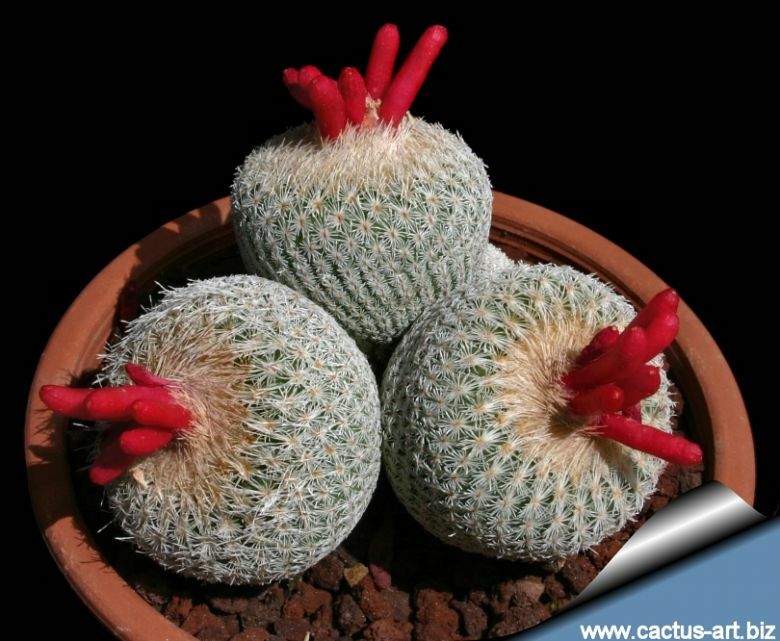 Glass: Clustering miniature cactus; an old plant may have more than 100 heads, and be 10 cm of diameter. Spines are grey/whitish, pastel or ocre. Distribution: it occurs in a limited area of Coahuila. Epithelantha micromeris var. rufispina (Bravo) Backeb. 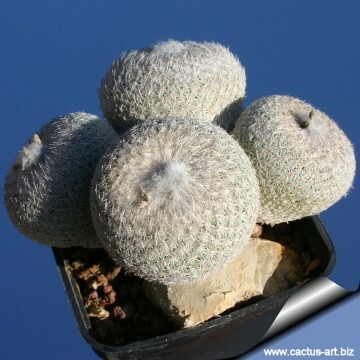 : Minute globular cactus, becoming somewhat elongated when old. the spines are numerose up to 40 whitish all radials, turning to a grey-reddish or brownish tinge in adult plants crown. The spine base is reddish. Epithelantha micromeris var. texensis f. cristata hort. : Crested form. Epithelantha micromeris subs. unguispina (Boed.) N.P.Taylor: It is a little larger than the standard form. Stem globular, up to 6 cm, often clumping over time. It generally has a small projecting black-tipped central spine, 4-5mm long. Origin: Near Monterrey, Nuevo Leon, south into San Luis Potosi. 16) Corral-Díaz, R., Fitz Maurice, B, Fitz Maurice, W.A., Goettsch, B.K., Heil, K. & Terry, M. 2013. Epithelantha micromeris. In: IUCN 2013. "IUCN Red List of Threatened Species." Version 2013.2. <www.iucnredlist.org>. Downloaded on 19 February 2014. Cultivation and Propagation: Although regarded as a choice and difficult plant, in cultivation it is relatively easy. It needs a particularly well-draining soil mix (rot prone). Water sparingly. There are a total of 17 Photos.